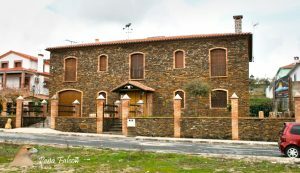 The rural house is built in slate a very typical material in Extremadura and is not indifferent to see it is also located at the door of the National Park of Monfragüe. When we enter the house we are welcomed by a cozy lounge with television, fireplace and heating for the winter and air conditioning in the summer, when the heat squeezes. The foyer is decorated with different typical rural motifs in Extremadura, stone and slate, wood and clay, utensils from old trades and objects used in the past that are now worthy of museums. The kitchen is very spacious and is fully equipped with dishwasher, microwave, coffee maker, vitroceramic hob and cooking accessories. We go up to the first floor where there are rooms that all have individual bathroom, air conditioning and heating, TV and wardrobes with large capacity, are five double rooms and a double bed, which we access by a wide and comfortable corridor. We also provide a telecommunications service with telephone, fax and internet access. Outside the house we offer a space for leisure, to read or for children to enjoy, with barbecue and tables, summer nights are great to sit in the garden and chat with friends under the stars of the sky of Monfragüe. Maximum number of tenants 14 complete house.